Our Apple Cranberry Cobbler Cake blends the fresh flavors of the season with a yummy cake topping. As the name indicates, our Simply Chocolate Cake with Whipped Cream and Berries is easy enough even a novice in the kitchen can prepare it! Heather taught our youngest niece, Esperanza, 10, to prepare this tasty treat on a recent trip to down South. Kids love to be included in family activities and taught how to do new things. Not only are they usually quick learners, but they oftentimes surprise us with their natural talent. 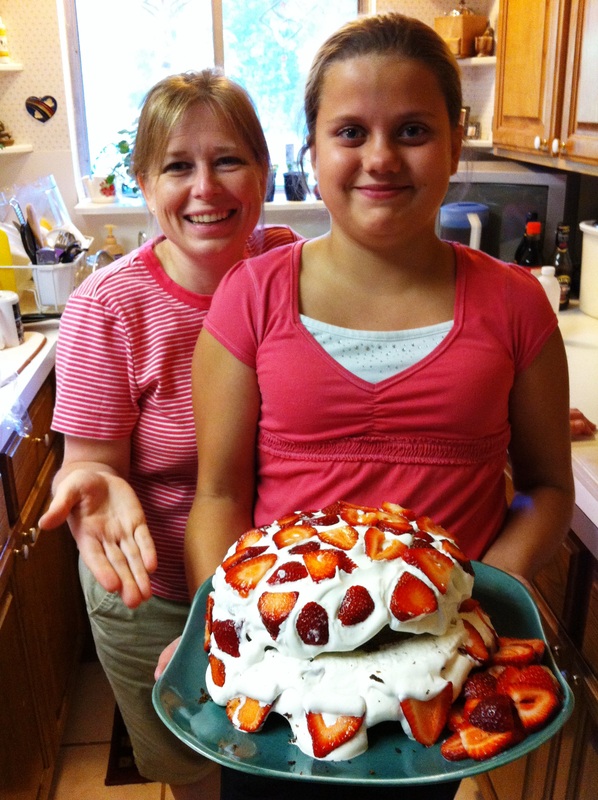 On a recent trip down South to visit family, we taught our youngest niece, Esperanza, 10, how to make this yummy cake. She did a spectacular job, and we were so proud of her effort. In fact, she liked it so much that she promised to make it for us again when we come for another visit! Bake cakes and cool completely. Whip the cream to soft peaks, then add the sugar and vanilla, and whip again until just stiffened. Do not over mix! Slice the top off 1 cake round to make a flat surface. Spread bottom cake round with a thick layer of whipped cream. Top with half the strawberries. Top with the other cake round and spread with another thick layer of whipped cream. Top with remaining strawberries. Slice and serve with any extra whipped cream and berries on the side. With this simple chocolate cake recipe, you'll never have to buy a boxed cake mix again! 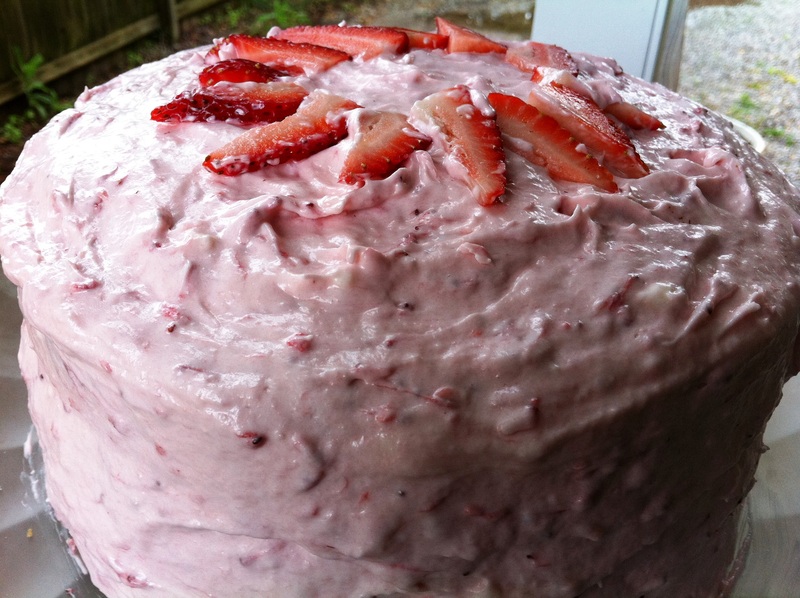 Why use boxed cake mixes when it is just as simple to make your own cake from scratch? 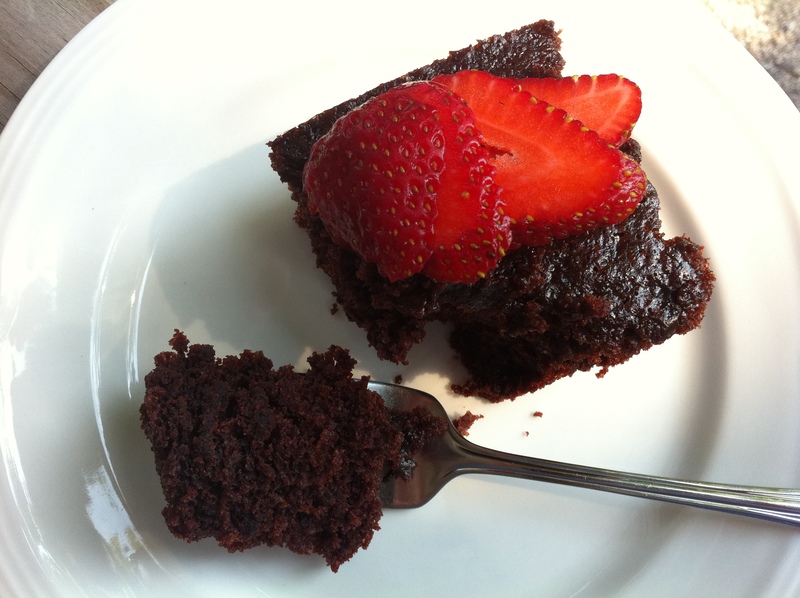 Not only does our chocolate cake take only minutes to prepare, but it is also light, rich and oh-so-delicious. Top it with fruit, ice cream, your favorite icing, or double this recipe and dish up a layered cake with whipped cream and berries! Preheat oven to 350°F. Liberally butter an 8-inch round cake pan or an 8-inch square baking pan, set aside. In a large bowl, whisk together all-purpose flour, sugar, unsweetened cocoa powder, baking soda and kosher salt. Make a well in the center of the flour mixture and add vegetable oil, pure vanilla extract, white vinegar and cold water. Whisk until well combined. Pour batter into prepared pan. Bake until a toothpick inserted in center comes out clean, about 35 to 40 minutes. Let cool completely in pan on a wire rack. 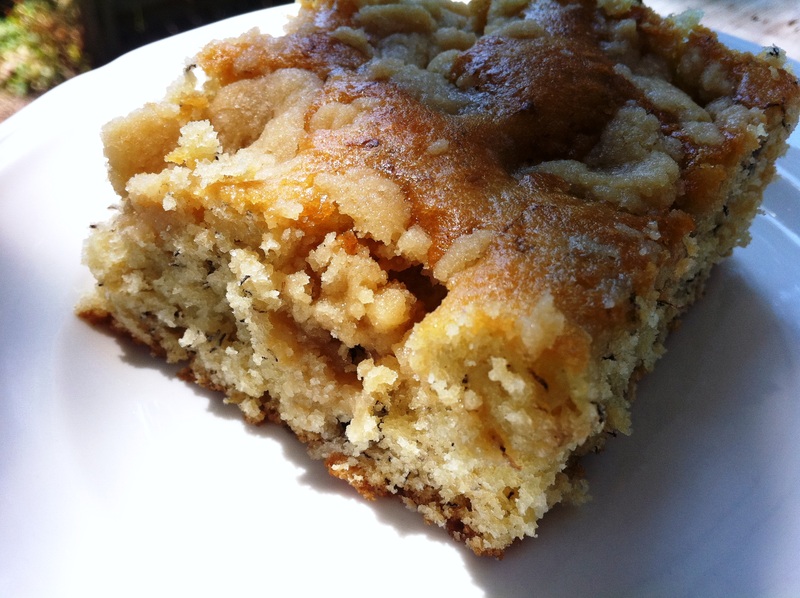 Naturally sweetened with ripened fruit and a touch of brown sugar, our Banana Cake is a Sunday brunch favorite. We’re always looking for tasty treats to feed our friends when we entertain. This sweet treat is moist and naturally sweetened with ripe bananas and a bit of dark brown sugar. It is perfect to dish up at Sunday brunch with eggs and bacon or for dessert with a scoop of ice cream after your favorite Mexican dinner. Preheat the oven to 300°F. In a large bowl, combine the flour, baking powder, baking soda, salt and sugar. Blend in the melted butter, mixing together until moist. Add ¼ cup of the buttermilk and combine. In a separate bowl, combine the other ¼ cup of buttermilk with the eggs and blend into the flour mixture. Add the vanilla and mashed bananas. Beat for 1 minute. Place the batter in a greased 9 x 13 x 2-inch pan. To make the topping, squeeze the flour, brown sugar and butter together with your hands. Crumble the topping evenly over the batter. Bake for 35 to 40 minutes. When the cake is done, an inserted toothpick or fork should come out clean from the center. Biting into our Strawberry Dream Cake is so light and fluffy and it is like feasting on a delicious morsel of summer sky. We love summer! There is something magical about the season when flowers bloom big and bright, hummingbirds and butterflies flutter about industriously, and fat clouds dance slowly across azure skies on lazy afternoons. Savor a bit of summer magic when you sink your teeth into our Strawberry Dream Cake, a family favorite that is pink, delicious and light as a cloud. Filled with fruit and whipped cream cheese frosting, it is sure to be a welcome addition to your baking repertoire! For the cake: Adjust oven rack to middle position and heat oven to 350°F. Grease two 9-inch round cake pans, line bottoms with parchment, grease parchment, and flour. Transfer strawberries to bowl, cover, and microwave until strawberries are soft and have released their juice, about 5 minutes. Place in fine-mesh strainer set over small saucepan. Firmly press fruit dry (juice should measure at least ¾ cup); reserve strawberry solids. Bring juice to boil over medium-high heat and cook, stirring occasionally, until syrupy and reduced to ¼ cup, 6 to 8 minutes. Whisk milk into juice until combined. Whisk strawberry milk, egg whites, and vanilla in bowl. Using stand mixer fitted with paddle, mix flour, sugar, baking powder, and salt on low speed until combined. Add butter, 1 piece at a time, and mix until only pea-size pieces remain, about 1 minute. Add half of milk mixture, increase speed to medium-high, and beat until light and fluffy, about 1 minute. Reduce speed to medium-low, add remaining milk mixture, and beat until incorporated, about 30 seconds. Give batter final stir by hand. For the frosting: Using stand mixer fitted with paddle, mix butter and sugar on low speed until combined, about 30 seconds. Increase speed to medium-high and beat until pale and fluffy, about 2 minutes. Add cream cheese, one piece at a time, and beat until incorporated, about 1 minute. Add reserved strawberry solids and salt and mix until combined, about 30 seconds. Refrigerate until ready to use, up to 2 days.